New Zealand Rugby says a hotel room where the All Blacks held meetings in Sydney was bugged before a match against Australia. 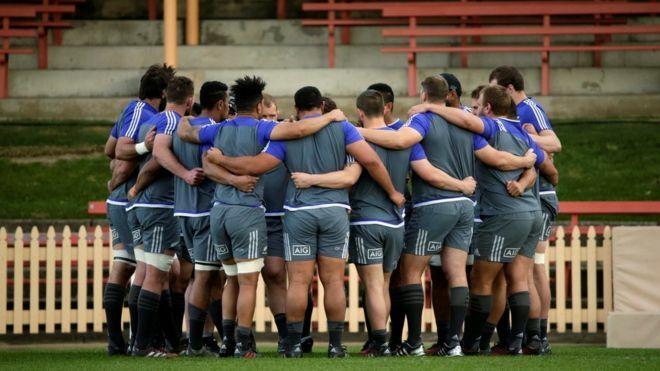 The All Blacks are due to play Australia’s Wallabies on Saturday. The CEO of New Zealand Rugby, Steve Tew, said in a statement that Australian police and the Australian Rugby Union had been informed. The New Zealand Herald reports that hiding the bug “was a highly skilled and meticulous act and whoever put it there would have needed a significant amount of time to have pulled off such an accomplished job”. Indications are that the device was working and would have transmitted conversations about the All Blacks’ strategy for Saturday’s match. Saturday’s game is the first of three in the annual Bledisloe Cup between Australia and New Zealand. It is the only match in this year’s tournament scheduled to take place on Australian soil; the other two games are scheduled to be held in New Zealand cities. The All Blacks have won the Cup 43 times while the Wallabies have won 12 times. Sydney police told the BBC they were not yet ready to comment.